After the first year, a small number of students who were not pre-approved to major in business will be allowed to do so. This number will include both students currently matriculated at Notre Dame as well as some students applying to Notre Dame from other universities. The number of openings will be managed to ensure the University achieves the 550 degree goal per class for Mendoza. The selection process for first-year students without a pre-approved status and transfer students will be conducted by the Office of Undergraduate Admissions. Decisions will be made based on academic performance to date at Notre Dame or elsewhere, a written statement addressing the reasons the student wants to pursue a business major, and a holistic evaluation of the non-academic accomplishments of the student that is consistent with the evaluation the University currently provides to all applicants for first-year and transfer admission. 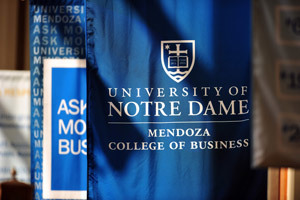 More information is available at enrollmentdivision.nd.edu/mendoza-admissions-policies. Originally published by Dennis Brown at news.nd.edu on February 26, 2014.